In recent seasons, the dynamic husband-and-wife duo of David Finckel (cellist) and Wu Han (pianist) have teamed up with violinist Philip Setzer—David Finckel’s colleague in the legendary Emerson String Quartet for more than three decades—in performances of the piano trio literature. The Han-Setzer-Finckel Trio is a formidable triumvirate of three masterful musicians– what they can so individually, though, is surpassed by what they do together. As an ensemble, they present a systematic yet passionate approach that sets the bar for how chamber music should be played. Violinist Philip Setzer, a founding member of the Emerson String Quartet, is a versatile musician with innovative vision and dedication to keep the art form of the string quartet alive and relevant. Mr. Setzer won second prize at the Marjorie Merriweather Post Competition in Washington, DC, and in 1976 received a Bronze Medal at the Queen Elisabeth International Competition in Brussels. David Finckel and Wu Han are among the most esteemed and influential classical musicians in the world today. Recipients of Musical America’s Musicians of the Year award, the energy, imagination, and integrity they bring to their concert performances and artistic projects go unmatched. San Antonio audiences can still remember the concert they played on our series in March, 2013. Finckel and Han are also co-Artistic-Directors of the Chamber Music Society at Lincoln Center, Music @Menlo in the San Francisco Bay area, and a Winter Festival in Korea. TheaterJones: This is probably a question that you get a lot, but what’s it like to be able to play at such a high level with your husband? Wu Han: Yes, I do get that question a lot! [Laughs] We started our relationship playing together before being romantically involved and somehow that intensity and chemistry started from the first time we played together. So even before we were involved, people would come up to us and ask, “Are you guys married?” And at the beginning, we just laughed and thought, “What are they talking about?” We are very fortunate, though. We have to make sure we keep things incredibly professional—not taking personal issues into rehearsal or our professional activities. That we make separate. It’s an unusual and treasured relationship, musically especially, so we take it really seriously. We still rehearse a lot and love working together. We just don’t think about who forgot to do dishes last night or didn’t put their clothes away at any of our rehearsals or performances, which I think is what it should be. A lot of times when chamber groups perform, the members haven’t necessarily played with each other very much, nor do they know each other very well. What’s it like to play in a trio with your husband and then a violinist he’s worked with for decades? How does that inform your rehearsals and performances, that you know each other so well? It’s fascinating—people assume that if you know each other well, you’ll play well, but that’s never the case—I know many good friends or couples who hardly make music together—they just can’t play together at all. So I think—with David and Phil [Setzer] there’s always been this basic chemistry, even when they first met 35 years ago. What’s really great about the repertoire for piano trio? What’s your favorite repertoire for trio, and why? I love Schubert—there’s just no other composer I love more. So it all started with Schubert! My next favorite composer is Beethoven. These two composers, thank God, both devoted energy to the trio genre. Beethoven wrote seven throughout his life, Schubert wrote 2 major trios before he died. Piano trio is very different from other chamber music genres—each individual has to be a very, very strong player. There cannot be a weak link, either technically or with chamber music skills or listening skills. You have to play piano trios as well as you play your solo repertoire. At the same time, you have to have all the chamber music chops, meaning you have to be able to respond spontaneously, you have to be able to control your instrument, be able to really make sure the balance is correct within the whole, complete group, not just your individual part. It’s a very demanding genre, and we certainly love it. I just think piano trio is the best! This will be our first time playing for the Dallas audience as a trio. Besides the Brahms and Mendelssohn C Minor, there’s a lot more repertoire to go! We just played a program of Shostakovich and Beethoven—it was heaven! On Sunday, April 28, the stars are aligned when these three legendary musicians come together for a first-time performance in San Antonio. Be there to experience the alchemy of the Han-Setzer-Finckel Trio and witness the magic of three consummate artists expressing diverse musical ideas in one voice. The audience at the Eighth Blackbird concert last Sunday were promised a novel and exciting experience; they got it. 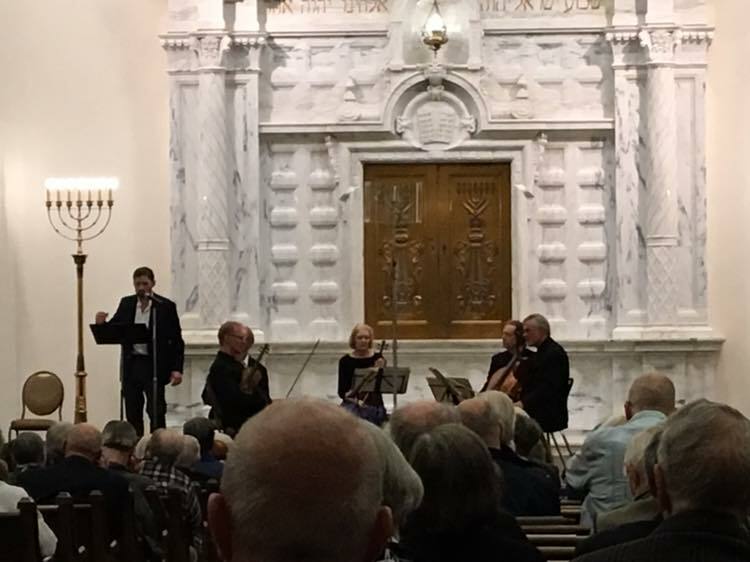 If you were expecting four or five string musicians in their somber black suits and dresses performing the usual chamber music fare (16th, 17th and 18th Century composers with maybe a little 19th and 20th century thrown in for good measure), you were definitely surprised. Rather than the usual, San Antonio Chamber Music Society presented the unusual: six very talented musicians performing very modern music on roughly a dozen instruments. This was “experiential music” as opposed to “expected music.” To explain: think about a painting by Georges Seurat, say “A Sunday Afternoon at the Island of the Grande Jatte,” a prime example of pointillism. The reason it fascinates is a bit of a trick it plays on the brain: you are deceived into believing you are looking at an ordinary Impressionist painting, but it is actually an impression of impressionism: thousands of tiny dots of paint, leading the brain to the experience of summer light and enjoyment. The genre-bending compositions performed by Eighth Blackbird accomplished a similar feat. They weren’t thematic in the usual sense – they were compositions by young composers and their fresh visions of classical music defy being shoved into a box. Just as in the Seurat painting, it would be useless to try to pick apart each tiny color. You simply have to take in the whole and just enjoy. (I did wonder if others in the audience felt as chilled as I did during “The Clarity of Cold Air” or experienced the rocks and water tumbling in “Eroding.”) The compositions crossed one genre line after another from jazz to blues to where-did-that-come-from to harmony to discord, from noise to barely perceptible whispers, from expected to totally amazing. These talented musicians also managed to express humor and pathos with their varied instruments; it was apparent they richly enjoyed what they were creating. The compositions crossed one genre line after another from jazz to blues to where-did-that-come-from to harmony to discord, from noise to barely perceptible whispers, from expected to totally amazing. Eighth Blackbird, hailed as “one of the smartest, most dynamic contemporary classical ensembles on the planet” (Chicago Tribune), began in 1996 as a group of six entrepreneurial Oberlin Conservatory students and quickly became “a brand-name defined by adventure, vibrancy and quality” (Detroit Free Press). 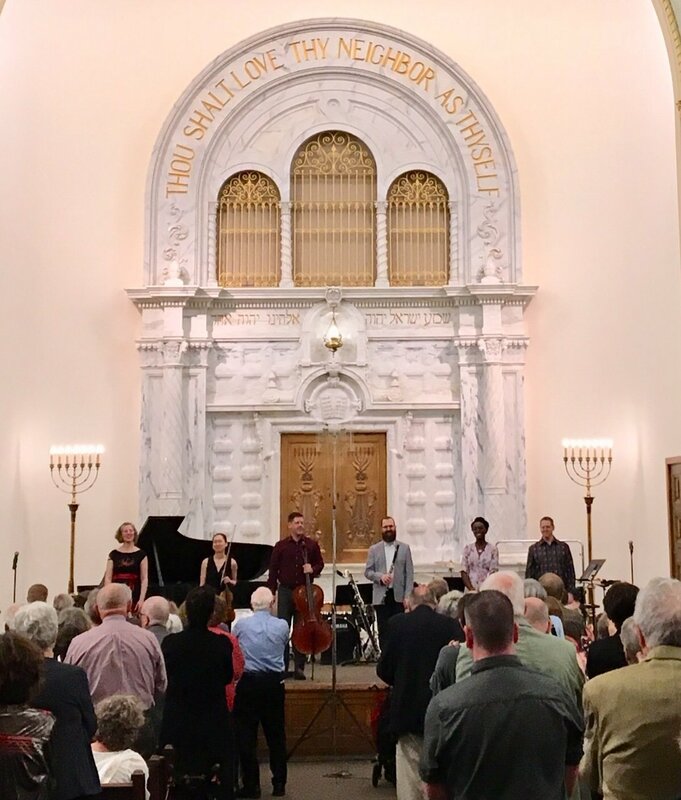 Over the course of more than two decades, Eighth Blackbird has continually pushed at the edges of what it means to be a contemporary chamber ensemble, presenting distinct programs in Chicago, nationally, and internationally, reaching audiences totaling tens of thousands. The sextet has commissioned and premiered hundreds of works by composers both established and emerging, and have perpetuated the creation of music with profound impact, such as Steve Reich’s Double Sextet, which went on to win the 2009 Pulitzer Prize. The ensemble’s extensive recording history, primarily with Chicago’s Cedille Records, has produced more than a dozen acclaimed albums and four Grammy Awards for Best Small Ensemble/Chamber Music Performance, most recently in 2016 for Filament. Longstanding collaborative relationships have led to performances with some of the most well-regarded classical artists of today from heralded performers like Dawn Upshaw and Jeremy Denk, to seminal composers like Philip Glass and Nico Muhly. In recent projects, Eighth Blackbird has joined forces with composers and performers who defy the persistent distinction between classical and non­classical music, including works by The National’s Bryce Dessner and Arcade Fire’s Richard Reed Perry, and performances with Justin Vernon of Bon Iver, My Brightest Diamond frontwoman Shara Nova, Will Oldham aka Bonnie “Prince” Billy and Iarla Ó Lionáird of The Gloaming, among others. Eighth Blackbird first gained wide recognition in 1998 as winners of the Concert Artists Guild Competition. Since 2000, the ensemble has called Chicago home, and has been committed to serving as both importer and exporter of world class artistic experiences to and from Chicago. A recent year-long pioneering residency at the Museum of Contemporary Art-Chicago, during which the ensemble served as a living installation with open rehearsals, performances, guest artists, and public talks, exemplified their stature as community influencers. Receiving the prestigious MacArthur Award for Creative and Effective Institutions, Chamber Music America’s inaugural Visionary Award, and being named Musical America’s 2017 Ensemble of the Year have supported Eighth Blackbird’s position as a catalyst for innovation in the new music ecosystem of Chicago and beyond. Eighth Blackbird’s mission—moving music forward through innovative performance, advocating for new music by living composers, and creating a legacy of guiding an emerging generation of musicians —extends beyond recording and touring to curation and education. The ensemble served as Music Director of the 2009 Ojai Music Festival, has held residencies at the Curtis Institute of Music and at the University of Chicago, and holds an ongoing Ensemble-in-Residence position at the University of Richmond. In 2017, Eighth Blackbird launched its boldest initiative yet with the creation of Blackbird Creative Laboratory, an inclusive, two-week summer workshop and performance festival for performers and composers in Ojai, CA. World Premier: this concert will feature a special SACMS-commissioned piece by S.A. composer Matthew Dunne to celebrate the life of the late San Antonio Symphony Principal Flutist Tal Perkes. 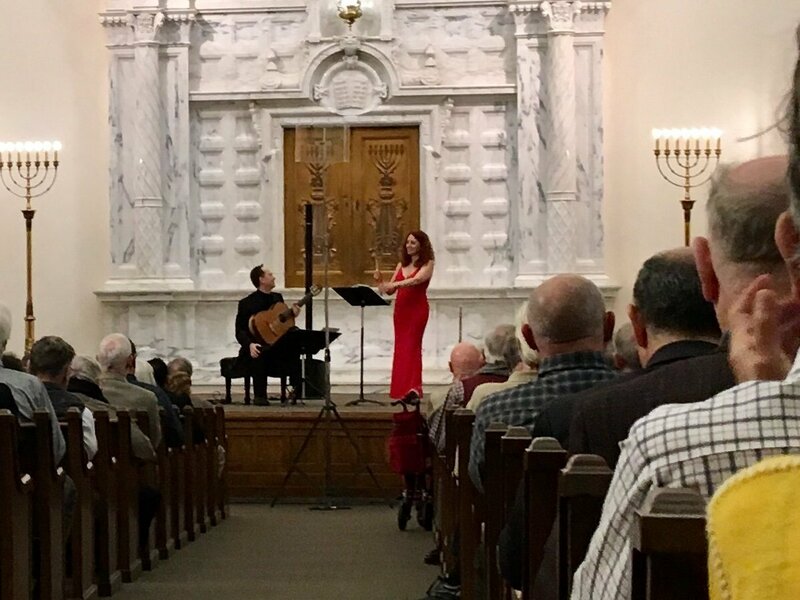 The Cavatina Duo – Eugenia Moliner, flute (Spain) and Denis Azabagic, guitar (Bosnia)—has become one of the most impressive combinations of its kind in the world. Dedicated soloists and chamber musicians, the Cavatina Duo breaks convention with their combination of instruments. Add to that their daring choices of varied and versatile repertoire, and the result is new sounds, colors and musical phrasings, which in return awakens a high level of emotion and audience response. A Cavatina Duo concert is a musical experience you don’t want to miss. The Cavatina Duo has captivated audiences with their electrifying performances in such major venues and festivals as Ravinia’s Rising Stars series (Chicago), Da Camera Society (Los Angeles), Aix-en-Provence Summer Festival (France), the National Concert Hall of Taipei (Taiwan), National Center for the Performing Arts in Beijing (China), National Flute Convention Gala Concert (USA), the Harris Theater (Chicago), Kolkata International Guitar Festival (India), Foundation Principe Felipe and Palau de la Musica (Spain), among many others. Cavatina Duo has performed with orchestras and string quartets in Europe, USA, India, South Korea and Mexico including the Chicago Sinfonietta, Traverse Symphony, Sarajevo Philharmonic, Daejeon Philharmonic and the Youth Orchestra of Monterrey, Mexico. In 2010 Cavatina Duo gave the world premier of another work commissioned by them from Alan Thomas, “Concerto for Flute, Guitar and Orchestra,” with the Camerata Serbica at the Guitar Art Festival in Belgrade. Eugenia Moliner has been acclaimed as “brilliant” by the British Flute Society magazine. She has performed with principal musicians from the Chicago Symphony, Rotterdam Philharmonic and Toronto Symphony orchestras as well with many chamber ensembles, including the Chicago Chamber Musicians, Civitas Ensemble, Chinese Fine Arts Musicians. This season she will collaborate with the Aspen String Trio. Her discography includes seven CDs. A prize-winner in twenty-four international competitions, Denis Azabagic has been described as a “virtuoso with flawless technique” by Soundboard Magazine. He has appeared as soloist with orchestras such as the Chicago and Madrid Symphonies, among many others. Azabagic has collaborated with the Chicago Chamber Musicians, the Civitas Ensemble and the Cuarteto Casals. His discography includes twelve CDs, two DVDs and a manual.